Phytochemical constituents and antioxidant activities of the whole leaf extract of Aloe ferox Mill. Background: Aloe ferox Mill. (Asphodelaceae) is used in South Africa for the treatment of constipation among various ailments. Despite the extensive studies conducted on the antioxidant activities of the leaf gel and pulp extract of the plant, there is no information on the antioxidant properties of the whole leaf extract of the species. Materials and Methods: The antioxidant activities of ethanol, acetone, methanol and aqueous extracts of A. ferox were investigated spectrophotometrically against 1,1­ diphenyl­2­picrylhydrazyl (DPPH), 2,2Ͳ-azino-bis(3-ethylbenzthiazoline-6-sulfonic acid) (ABTS) diammonium salt, hydrogen peroxide (H 2 O 2 ), nitric oxide (NO), lipid peroxidation and ferric reducing power. Total phenols, flavonoids, flavonols, proanthocyanidins, tannins, alkaloids and saponins were also determined using the standard methods. Results: The percentage compositions of phenols (70.33), flavonols (35.2), proanthocyanidins (171.06) and alkaloids (60.9) were significantly high in the acetone extract, followed by the ethanol extract with values of 70.24, 12.53, 76.7 and 23.76 respectively, while the least composition was found in the aqueous extract. Moreover, both flavonoids and saponins contents were appreciably high in both methanol and ethanol extracts, while others were very low. Tannins levels were, however, not significantly different (P > 0.05) in all the solvent extracts. At 0.5 mg/ml, the free radical scavenging activity of the methanol, acetone and ethanol extracts showed higher inhibition against ABTS, hydrogen peroxide and nitric oxide radicals. Whereas, scavenging activity of the extracts against DPPH* and lipid peroxidation were observed at a concentration of 0.016 and 0.118 mg/ml respectively in comparison to the butylated hydroxyltoluene (BHT), gallic acid and rutin. The ferric reducing potential of the extracts was concentration dependent and significantly different from that of vitamin C and BHT. Conclusion: The present study showed high level of radical scavenging activity by ethanol and methanol whole leaf extracts of A. ferox with higher antioxidant activities than acetone and aqueous extracts. The significant differences show that the whole leaf extract could be used as a potent antioxidant in medicine and food industries. Aloe ferox (Cape aloe), locally called ikhala in Xhosa, is widely distributed in Free State, Lesotho, Western and Eastern Cape of South Africa. It is a perennial, single-stemmed shrub, reaching 2-3 m in height, with thick succulent leaves bearing brown spines on the margin. For centuries, the leaf exudate of A. ferox has been used therapeutically for the treatment of constipation. Today, the plant is reputed for its antiseptic, laxative, moisturizing, cleansing and anti-inflammatory properties. Traditionally, the fresh and dried whole leaf extract of the plant is used directly as an infusion and decoction for the treatment of various diseases such as skin cancer, gastrointestinal disorder, inflammation, burns and psoriasis. , The leaf gel has been extensively documented to have significant laxative,  anti-inflammatory,  wound healing,  sexually transmitted diseases cure,  control of gastrointestinal parasite,  immunostimulant, antioxidant, antitumor and antidiabetic activities. Furthermore, the leaf gel and pulp extract of the plant have several pharmacological effects such as antimicrobial and antitumor properties. , We previously reported the laxative and toxicological effect of the aqueous whole leaf extract of A. ferox in the treatment of constipation. , Despite the extensive studies conducted on the antioxidant activities of the leaf gel and pulp extract of A. ferox, , there is no information in the scientific literature on the antioxidant properties of the whole leaf extract of the species. Therefore, the present study was aimed at determining the quantitative phytochemical constituents, free radical scavenging and antioxidant activities of the whole leaf extract of A. ferox using various solvents. Fresh mature whole leaves of A. ferox were collected in June 2009 at Ntselamanzi area of the Eastern Cape Province of South Africa. The plant was authenticated by Prof. D. S. Grierson at the Department of Botany, University of Fort Hare, and a voucher specimen (Wintola Med. 2009/01) was deposited at the Giffen herbarium of the University. The leaves were oven dried to constant weight at 40°C and milled to a homogeneous powder. The powdered plant material (200 g) was extracted separately in distilled water, acetone, methanol and ethanol on a shaker (Stuart Scientific Orbital Shaker, Essex, UK) for 48 h. Each extract was filtered using a Buchner funnel and Whatman No. 1 filter paper. The filtrate obtained with water was frozen at −40°C and dried for 48 h using a freeze dryer (Vir Tis benchtop K, Vir Tis Co., Gardiner, NY, USA) to give a yield of 31.2 g of dried extract. The other extracts were individually concentrated to dryness under reduced pressure at 40°C using a rotary evaporator. Acetone, methanol and ethanol extracts yielded 19.5 g, 25.6 g and 20.6 g, respectively. The resulting extracts were reconstituted with their respective solvents to give the desired concentrations used in the study. The following chemicals were used for the various experiments: 1,1­diphenyl-­2-­picrylhydrazyl (DPPH), 2,2′-azino-bis(3-ethylbenzthiazoline-6-sulfonic acid) (ABTS), vanillin, aluminium chloride (AlCl 3 ), potassium acetate (CH 3 CO 2 K), ferric chloride (FeCl 2 ), BHT, ascorbic acid, rutin, Folin-Ciocalteu reagent, sodium carbonate (Na 2 CO 3 ), phosphate buffer, potassium ferricyanide [K 3 Fe(CN) 6 ], trichloroacetic acid (TCA), 2-thiobarbituric acid (TBA), glacial acetic acid (CH 3 COOH), sodium nitroprusside (Na 2 [Fe(CN) 5 NO]2H 2 O). They were purchased from Merck, Gauteng, South Africa. All other chemicals used were of analytical grade. The amount of phenol in the whole leaf extracts of A. ferox was determined spectrophotometrically using the modified method of Wolfe et al.,  with Folin-Ciocalteu reagent. An aliquot of the extract was mixed with 5 ml Folin-Ciocalteu reagent (previously diluted with water at a concentration of 1:10 v/v) and 4 ml (75 g/l) of sodium carbonate. The tubes were vortexed for 15 s and left to stand for 30 min at 40°C for color development. Absorbance was then measured at 765 nm using the AJI-C03 UV-VIS spectrophotometer. Results were expressed as mg/g of tannic acid equivalent using the calibration curve: Y = 0.121x, R2 = 0.936512, where x is the absorbance and Y is the tannic acid equivalent. Total flavonoid content was determined using the method of Ordon Ez et al. A volume of 0.5 ml of 2% AlCl 3 ethanol solution was added to 0.5 ml of the sample solution. After 1 h at room temperature, the absorbance was measured at 420 nm. A yellow color indicated the presence of flavonoids. Plant extracts were evaluated at a final concentration of 0.1 mg/ml. Total flavonoid content was calculated as mg/g of quercetin using the following equation based on the calibration curve: Y = 0.0255x, R2 = 0.9812, where x is the absorbance and Y is the quercetin equivalent. Total flavonol content was determined by adopting the procedure described by Kumaran and Karunakaran. The reaction mixture consisted of 2.0 ml of the sample, 2.0 ml of AlCl 3 prepared in ethanol and 3.0 ml of (50 g/l) sodium acetate solution. The absorbance at 440 nm was measured after 2.5 h at 20°C. Total flavonol content was calculated as mg/g of quercetin equivalent from the calibration curve using the equation: Y = 0.0255x, R2 = 0.9812, where x is the absorbance and Y is the quercetin equivalent. Total proanthocyanidin was determined based on the procedure of Oyedemi et al. To 0.5 ml of 1 mg/ml of the extract solution was added 3 ml of vanillin-methanol (4% v/v) and 1.5 ml of hydrochloric acid and vortexed. The mixture was allowed to stand for 15 min at room temperature and the absorbance was measured at 500 nm. Total proanthocyanidin content was evaluated at a concentration of 0.1 mg/ml and expressed as catechin equivalent (mg/g) using the calibration curve equation: Y = 0.5825x, R2 = 0.9277, where x is the absorbance and Y is the catechin equivalent. Tannin determination was done according to the method of AOAC  with some modifications. To 0.20 g of the sample was added 20 ml of 50% methanol. This was shaken thoroughly and placed in a water bath at 80°C for 1 h to ensure uniform mixing. The extract was filtered into a 100-ml volumetric flask, followed by the addition of 20 ml of distilled water, 2.5 ml of Folin-Denis reagent and 10 ml of 17% aq. Na 2 CO 3 and was thoroughly mixed. The mixture was made up to 100 ml with distilled water, mixed and allowed to stand for 20 min. The bluish-green color developed at the end of the reaction mixture of different concentrations ranges from 0 to 10 ppm. The absorbance of the tannic acid standard solutions as well as sample was measured after color development at 760 nm using the AJI-C03 UV-VIS spectrophotometer. Results were expressed as mg/g of tannic acid equivalent using the calibration curve: Y = 0.0593x - 0.0485, R2 = 0.9826, where x is the absorbance and Y is the tannic acid equivalent. Alkaloids were quantitatively determined according to the method of Harborne. Two hundred milliliters of 10% acetic acid in ethanol was added to 5 g powdered plant sample, covered and allowed to stand for 4 h. The filtrate was then concentrated on a water bath to one-fourth of its original volume. Concentrated ammonium hydroxide was added dropwise to the extract until the precipitation was completed and the whole solution was allowed to settle. The collected precipitates were washed with dilute ammonium hydroxide and then filtered. The residue was dried and weighed. The alkaloid content was determined using the formula: % alkaloid = final weight of the sample / initial weight of the extract × 100. Quantitative determination of saponins was done using the method of Obadoni and Ochuko. The powdered sample (20 g) was added to 100 ml of 20% aqueous ethanol and kept in a shaker for 30 min. The samples were heated over a water bath for 4 h at 55°C. The mixture was then filtered and the residue re-extracted with another 200 ml of 20% aqueous ethanol. The combined extracts were reduced to approximately 40 ml over the water bath at 90°C. The concentrate was transferred into a 250 ml separatory funnel and extracted twice with 20 ml diethyl ether. The ether layer was discarded while the aqueous layer was retained and to which 60 ml n-butanol was added. The n-butanol extracts were washed twice with 10 ml of 5% aqueous sodium chloride. The remaining solution was heated on a water bath. After evaporation, the samples were dried in the oven at 40°C to a constant weight. The saponin content was calculated using the formula: % saponin = final weight of sample/initial weight of extracts × 100. The antioxidant activities of the whole leaf extracts of A. ferox were determined using DPPH, ABTS, reducing power, lipid peroxidation, nitric oxide and hydrogen peroxide. The reducing power of the whole leave extract of A. ferox was evaluated according to the method described by Aiyegoro and Okoh. The mixture containing 2.5 ml of 0.2 M phosphate buffer (pH 6.6) and 2.5 ml of K 3 Fe(CN) 6 (1% w/v) was added to 1.0 ml of the extracts and standards (0.025-0.5 mg/ml) prepared in distilled water. The resulting mixture was incubated for 20 min at 50°C, followed by the addition of 2.5 ml of TCA (10% w/v), which was then centrifuged at 3000 rpm for 10 min. 2.5 ml of the supernatant was mixed with 2.5 ml of distilled water and 0.5 ml of FeCl 3 (0.1% w/v). The absorbance was then measured at 700 nm against blank sample. Increased absorbance of the reaction mixture indicated higher reducing power of the plant extract. The method of Liyana-Pathiana and Shahidi  was used for the determination of scavenging activity of DPPH free radical. DPPH (1 ml, 0.135 mM) prepared in methanol was mixed with 1.0 ml of aqueous extract ranging from 0.025 to 0.5 mg/ml. The reaction mixture was vortexed thoroughly and left in the dark at room temperature for 30 min. The absorbance was measured spectrophotometrically at 517 nm. The scavenging ability of the plant extract was calculated using the equation: DPPH scavenging activity (%) = [(Abs control - Abs sample)]/(Abs control)] × 100, where Abs control is the absorbance of DPPH + methanol and Abs sample is the absorbance of DPPH radical + sample (sample or standard). The method described by Adedapo et al. was adopted for the determination of ABTS activity of the plant extract. The working solution was prepared by mixing two stock solutions of 7 mM ABTS and 2.4 mM potassium persulfate in equal amounts and allowed to react for 12 h at room temperature in the dark. The resulting solution was further diluted by mixing 1 ml ABTS + solution with 60 ml methanol to obtain an absorbance of 0.706 ± 0.001 units at 734 nm after 7 min using a spectrophotometer. The percentage inhibition of ABTS + by the extract was calculated from the following equation: % inhibition = [(Abs control - Abs sample)]/(Abs control)] × 100. The modified method described by Oyedemi et al. was used to determine the nitric oxide radical scavenging activity of aqueous and other solvent extracts of A. ferox. 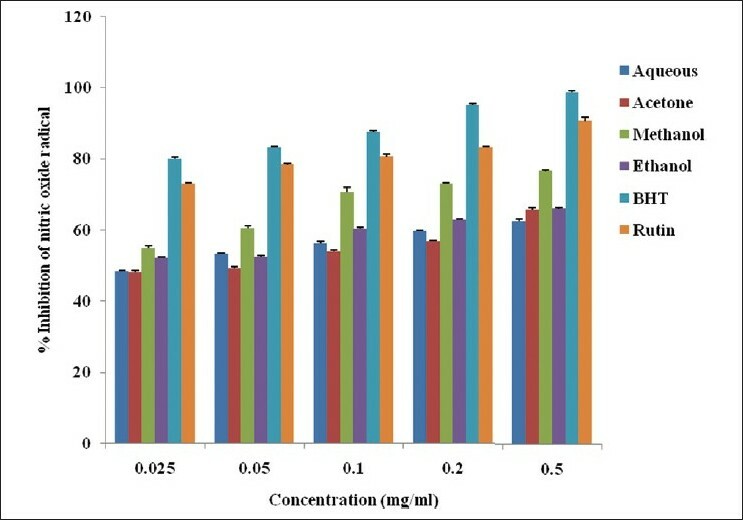 A volume of 2 ml of 10 mM of sodium nitroprusside prepared in 0.5 mM phosphate buffered saline (pH 7.4) was mixed with 0.5 ml of plant extracts, gallic acid and BHT individually at 0.025-0.5 mg/ml. The mixture was incubated at 25°C for 150 min. 0.5 ml of the incubated solution was mixed with 0.5 ml of Griess reagent [1.0 ml sulfanilic acid reagent (0.33% prepared in 20% glacial acetic) acid at room temperature for 5 min with 1 ml of naphthylenediamine dichloride (0.1% w/v)]. The mixture was incubated at room temperature for 30 min, followed by the measurement of the absorbance at 540 nm. The amount of nitric oxide radicals inhibited by the extract was calculated using the following equation: NO radical scavenging activity (%) = [(Abs control - Abs sample)]/(Abs control)] × 100, where Abs control is the absorbance of NO radicals + methanol and Abs sample is the absorbance of NO radical + extract or standard. Hydrogen peroxide scavenging activity of the plant extract was estimated using the modified method described by Oyedemi et al. Plant extract (4 mg/ml) prepared in distilled water at various concentrations was mixed with 0.6 ml of 4 mM H 2 O 2 solution prepared in phosphate buffer (0.1 M pH 7.4) and incubated for 10 min. The absorbance of the solution was measured at 230 nm using the Biomate thermospectronoic, against a blank solution containing the plant extract without H 2 O 2 . The amount of hydrogen peroxide radical inhibited by the extract was calculated using the following equation: H 2 O 2 radical scavenging activity = [(Abs control - Abs sample)]/(Abs control) × 100, where Abs control is the absorbance of H 2 O 2 radicals + methanol and Abs sample is the absorbance of H 2 O 2 radical + sample or extract or standard. A modified thiobarbituric acid-reactive species (TBARS) assay described by Dasgupts and De  was used to measure the lipid peroxide formed, using egg-yolk homogenates as lipid-rich media. Egg homogenate (0.5 ml, 10% in distilled water, v/v) and 0.1 ml of the whole extract of A. ferox were mixed in a test tube and the volume was made up to 1 ml with distilled water. Finally, 0.05 ml FeSO 4 (0.07 M) was added to the mixture and incubated for 30 min to induce lipid peroxidation. Thereafter, 1.5 ml of 20% acetic acid (pH adjusted to 3.5 with NaOH) and 1.5 ml of 0.8% TBA (w/v) (prepared in 1.1% sodium dodecyl sulfate) and 0.05 ml 20% TCA were added, vortexed and heated in a boiling water bath for 60 min. After cooling, 5.0 ml of n-butanol was added to each tube and centrifuged at 3000 rpm for 10 min. The absorbance of the organic upper layer was measured at 532 nm. For the blank, 0.1 ml of distilled water was used in place of the extract. Where applicable, the results were expressed as mean ± standard deviation (SD) of three replicates and were subjected to analysis of variance using the student Minitab release version 12, Windows 95. Significant levels were tested at P < 0.05. Phytochemical analysis conducted on the whole leaf extracts of A. ferox revealed the presence of phenols, flavonoids, flavonols, proanthocyanidins, tannins, alkaloids and saponins [Table 1]. Most plants are used for the treatment of diseases because of the presence of these phytochemicals which have been reported to have high medicinal values. The concentrations of phenols in the different solvent extracts were significantly different from each other. This gives an indication that solvents possess different extracting capacity for phenol. The high content of phenol in the whole leaf extracts of A. ferox, observed in the acetone and ethanol extract, may be a contributing factor toward its antioxidant activity. The flavonoid content in the whole leaf extracts in the various solvents was in the order: methanol > ethanol > acetone > aqueous extracts. The flavonoid content in the methanol extract was significantly higher than the ethanol extract. Meanwhile, the aqueous and acetone extracts were not significantly different from each other in this aspect. The acetone extract possessed high flavonol content which was significantly different from the other solvent extracts evaluated in this study, and this may be linked to the polarity of the solvent used. This was followed by the ethanol, methanol and aqueous extracts in this order, but these were not significantly different from each other. A moderate amount of flavonols was observed in the methanol and aqueous extracts, but there was an appreciable amount in the acetone and ethanolic extracts. The acetone extract contained high proanthocyanidin content, followed by the ethanol, methanol and aqueous extracts [Table 1]. Tannin content was generally low in all the solvent extracts of A. ferox compared to all other phytochemicals. Alkaloid content of the whole leaf extract of A. ferox followed the trend: acetone > ethanol > methanol > aqueous extracts, as shown in [Table 1]. The acetone extract exhibited high concentration of alkaloids which was significantly different from other solvent extracts. The percentage concentration of saponins in the ethanol extract was significantly higher than other solvents, but lower in the aqueous extract. The extracts showed high percentage inhibition activity in all the free radical scavenging models evaluated in the present study. The potential of the plant extracts to reduce Fe 3+ to Fe 2+ by electron transfer is an indication of their antioxidant ability. The reducing power of the extracts in comparison with the standards (vitamin C and BHT) is presented in [Figure 1]. The observed change of yellow color of test solution to various shades of blue and green, depending on the concentration of the extract, is an indication of its antioxidant activity. 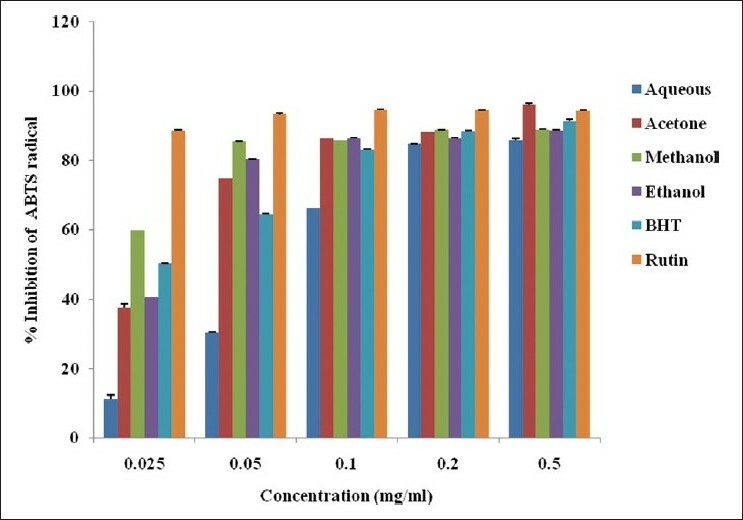 The ferric reducing activities of the extracts were significantly lower than the standard drugs used in this order: vitamin C > BHT > ethanol > acetone > methanol > aqueous extracts. 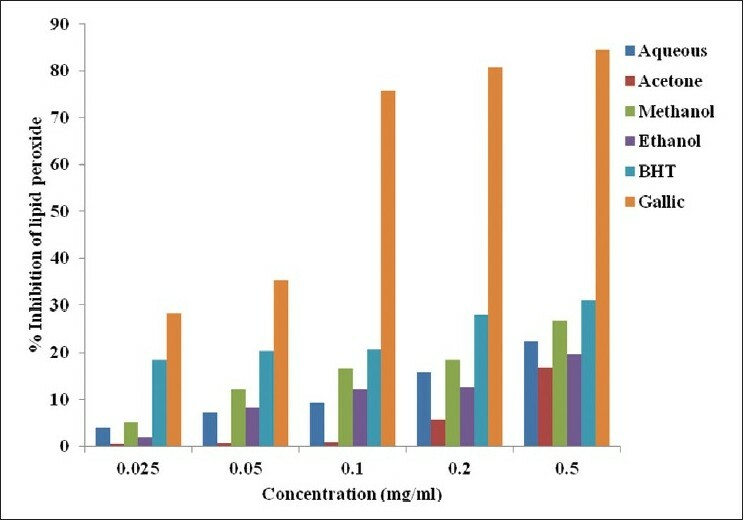 At 0.5 mg/ml, the absorbance values of acetone, methanol and ethanol extracts were comparable with vitamin C and BHT as depicted in [Figure 1]. The DPPH scavenging potential of the whole leaf extracts of A. ferox was concentration dependent as shown in [Figure 2]. The percentage inhibition of DPPH by the various solvent extracts and the standard drugs was recorded in decreasing order: BHT > rutin > methanol > ethanol > acetone > aqueous extract. The % inhibition of BHT and rutin was significantly different from the extracts. Though the aqueous extract showed the least inhibition, it was not significantly different from the other solvents. The IC 50 value of methanol extract was 0.086 mg/ml, acetone and ethanol extracts with similar value of 0.288 mg/ml and that of aqueous extract was 0.517 mg/ml. The percentage inhibition of ABTS radical by the various solvent extracts of A. ferox is shown in [Figure 3]. The % inhibition of ABTS by the various solvent extracts was concentration dependent and compared favorably well with the BHT and rutin. The scavenging activity in the various solvents was in the order: rutin > methanol > acetone > ethanol > BHT > aqueous extracts. 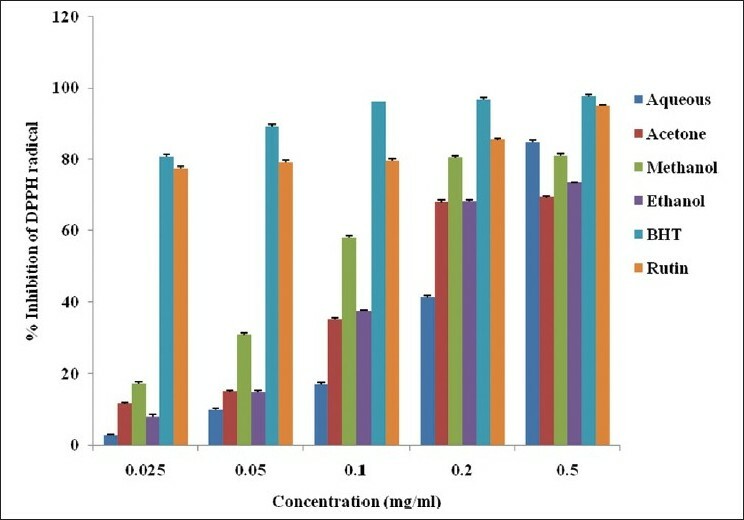 The acetone and ethanol extracts compared favorably well with BHT but lower than the methanol extract [Figure 3]. There was a significant difference in the % inhibition of ABTS· + at the different concentrations and solvents used. The methanol extract and BHT had IC 50 values of 0.02 and 0.024 mg/ml, respectively, followed by acetone and ethanol extracts at 0.033 and 0.062 mg/ml, respectively. The aqueous extract exhibited the least scavenging activity (0.173 mg/ml) in comparison with other solvent extracts. The radical scavenging activity of the whole leaf extract of A. ferox was reflected as the % inhibition of nitric oxide [Figure 4]. The activities of the various extracts were in the order: BHT > rutin > methanol > ethanol > aqueous > acetone extracts. The % inhibition of nitric oxide by the various solvent extracts differed significantly from those of BHT and rutin. The IC 50 values of 0.023, 0.024, 0.016 and 0.017 mg/ml were recorded for the methanol extract, ethanol extract, BHT and rutin respectively, while acetone and aqueous extracts had their activities at 0.077 and 0.074 mg/ml respectively. The scavenging activity of the whole leaf extract of A. ferox against hydrogen peroxide is shown in [Figure 5]. The scavenging activities of the plant in various solvents were in the order: acetone < ethanol < gallic acid< methanol < BHT < aqueous extract. The percentage inhibitions of hydrogen peroxide by the various solvents were concentration dependent and differed significantly from each other. The scavenging of lipid peroxides by the whole leaf extract of A. ferox , BHT and gallic acid is presented in [Figure 6]. The % inhibition of lipid peroxides by the various solvent extracts was recorded in increasing order: gallic acid > BHT > methanol > aqueous > ethanol > acetone extract. The % inhibition of lipid peroxidation by the various solvents did not differ significantly from the standard BHT as compared to gallic acid. The data showed a significant difference from the solvent extract used. Gallic acid had the highest inhibitory activity against lipid peroxidation, with an IC 50 value of 0.118 mg/ml, while BHT, aqueous, acetone, methanol, ethanol extracts were active with IC 50 values of 1.186, 1.837, 1.492, 0.930 and 1.270 mg/ml, respectively. Flavonoids are hydroxylated phenolics and are potent water-soluble antioxidants which help in radical scavenging and prevention of oxidative cell damage. They have been reported to possess strong antioxidant activities. , The concentration in the whole leaf extracts of A. ferox was low. However, methanol extracts had more flavonoids than the other solvent extracts investigated in this study. Tannins are known to be useful for the prevention of cancer as well as treatment of inflamed or ulcerated tissues. , However, tannin level was low and not significantly different in comparison to other solvent extracts used in this study. Alkaloids have been associated with medicinal purpose for centuries as agents possessing analgesic, antimalarial, antiseptic and bactericidal activities, but could be toxic to cells. In this study, the high content of alkaloids in the acetone, ethanol and methanol extracts of A. ferox could be responsible for its much acclaimed medicinal value. Saponins in medicinal plants are responsible for most biological effects related to cell growth and division in humans and have inhibitory effect on inflammation. , The level of saponin content in the solvent extracts of the whole leaf of A. ferox was quite moderate. However, ethanol extract produced more saponins than other solvents. There was no significant difference in saponin content in all the various solvent extracts investigated in this present study. The ability of a substance to act as an antioxidant depends on its strength to reduce ROS by donating hydrogen atom. The reducing capacity of a compound generally depends on the presence of reductants which exhibit antioxidative potential by breaking the free radical chain and donating hydrogen atom. It has been found that the transformation of Fe 3+ to Fe 2+ occurred in the presence of plant extract. A. ferox whole leaf extracts showed the reductive capabilities when compared to ascorbic acid and BHT. The reducing power of the extracts was concentration dependent and the antioxidant activities in all the solvents used were comparable with vitamin C and BHT. DPPH is a relatively stable free radical scavenger which converts the unpaired electrons to paired ones by hydrogen proton donation. Scavenging of DPPH radical in this study indicates the potency of the plant extracts in donating hydrogen proton to the lone pair electron of the radicals. Because the inhibition was more at a higher concentration in all the solvent extracts, it could be suggested that the plant extracts contain compounds capable of donating protons to the free radicals. The methods have proven the effectiveness of the extracts in a concentration-dependent manner. The weak activity observed in the DPPH radical scavenging assay may be as a result of the low level of flavonoid contents in the plant extracts. However, the ability of the plant extracts to scavenge DPPH radical could also reflect its ability to scavenge and inhibit the formation of ABTS + . The scavenging activity of ABTS·+ by the plant extracts was found to be higher than that of DPPH radical. The solubility of extracts in different testing systems and radical reactivity confirming the removal of odd electron are believed to be responsible for the higher scavenging activity of ABTS. The scavenging activity of ABTS + radical by the plant extract could imply that the extracts may be useful for treating radical related pathological damage, especially at higher concentrations. Nitric oxide is an important chemical mediator generated by endothelial cells, macrophages and neurons and is involved in the regulation of various physiological processes. Excess concentration of nitric oxide is associated with several diseases. , Oxygen reacts with the excess nitric oxide to generate nitrite and peroxynitrite anions, which act as free radicals. In the present study, the extract showed a moderate activity by competing with oxygen to react with nitric oxide and thus inhibits the generation of the anions. Hydrogen peroxide is an important ROS because of its ability to penetrate biological membranes. However, it may be toxic if converted to hydroxyl radical in the cell. The hydroxyl radical is an extremely reactive free radical formed in biological systems. It has been implicated as a highly damaging species in free radical pathology, capable of damaging almost every molecule found in living cells. Among the oxygen radicals, the hydroxyl radical is the most reactive and induces severe damage to adjacent biomolecules. Scavenging of H 2 O 2 by the extracts may be attributed to their phenolics, which donate electron to H 2 O 2 , and thus reduce it to water. The solvent extracts were capable of scavenging hydrogen peroxide in a concentration-dependent manner. This indicates the potency of the plant extracts in preventing the joining of nucleosides in the DNA and possible breakage leading to carcinogenesis and cytotoxicity. Free radical induced peroxidation in polyunsaturated lipids occurs either through ferryl-perferryl complex or through OH* radicals. In this study, lipid peroxidation was brought about by egg-yolk homogenates as lipid-rich media. The tested plant extracts showed weak antioxidant activity which is indicated by their high absorbance values. This study shows concentration-dependent prevention of lipid peroxide generation. The present study shows the scavenging activity of the whole leaf extracts of A. ferox in ethanol, methanol, acetone and aqueous extracts. 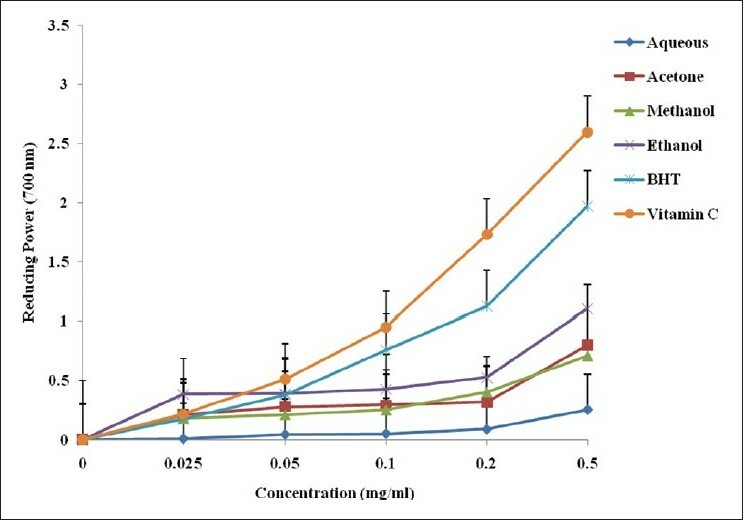 The activity was high in ethanol, acetone and methanol extracts, but low in aqueous medium, indicating their antioxidant potential. The observed results suggest further analyses to confirm its prophylactic effect in the treatment of free radical-mediated diseases. Most antioxidant activities depend on the amount of the phytochemicals present in the plants. Although the contents of most phytochemicals evaluated are not very high but synergistically boost the antioxidant activity of the whole leaf extracts of A. ferox. Thus the plant had potent antioxidant properties to curtail progression of radical related diseases and thereby give credence to the traditional usage of A. ferox extract. This research was supported by a grant from Govan Mbeki Research and Development Centre, University of Fort Hare. 1. Adedapo AA, Jimoh FO, Afolayan AJ, Masika PJ. Antioxidant activities and phenolic contents of the methanol extracts of the stems of Acokanthera oppositifolia and Adenia gummifera. BMC Complement Altern Med 2008;8:54­60. 2. Saha MN, Alam MA, Aktar R, Jahangir R. In vitro free radical scavenging activity of Ixora coccinea L. Bangladesh J Pharmacol 2008;3:90-96. 3. Lobo V, Patil A, Phatak A, Chandra N. Free radicals, antioxidants and functional foods: Impact on human health. Pharmacog Rev 2010;4:118-26. 4. Hazra B, Santana B, Nripendranath M. Antioxidant and free radicals scavenging activity of Spondias pinnata. BMC Complement Altern Med 2008;8:63. 5. Oyedemi SO, Bradley G, Afolayan AJ. In vitro and In vivo antioxidant activities of aqueous extract of Strychonos henningsii Gilg. Afr J Pharm Pharmacol 2010;4:70-8. 6. Gyamfi MA, Yonamine M, Aniya Y. Free radical scavenging action of medicinal herbs from Ghana Thonningia sanguine on experimentally induced liver injuries. Gen Pharmacol 2002;32:661-7. 7. Ara N, Nur H. In vitro antioxidant activity of methanolic leave and flower extract of Lippa alba. Res J Med Med Sci 2009;4:107­-10. 8. Robak J, Marcinkiewicz E. Scavenging of reactive oxygen species as the mechanism of drug action. Pol J Pharmacol Pharm 1995;47:89-98. 9. Sanchez JC, Garcia RF, Cors MM. 1,1 Diphenyl-2- picrylhydrazyl radical and superoxide anion scavenging activity of Rhizophora mangle (L.) bark. Pharmacog. Res 2010;2:279-84. 10. Madhavi DL, Salunkhe DK. Toxicological aspects of food antioxidants. In: Madhavi DL, Deshpande SS, Salunkhe DK, editors. Food antioxidants. New York: Dekker; 1995. p. 267. 11. Veerapur VP, Prabhakar KR, Parihar VP, Kandadi MR, Ramakrishana S, Mishra B, et al. Ficus racemosa stem bark extract: A potent antioxidant and a probable natural radioprotector. Evid Based Complement Alternat Med 2009;6:317-24. 12. Watt JM, Breyer-Brandwijk BN. Medicinal and Poisonous Plants of Southern and Eastern Africa. 2 nd ed. Edinburg, UK: Livingstone; 1962. 13. Grierson DS, Afolayan AJ. Antibacterial activity of some indigenous plants used for the treatment of wounds in the Eastern Cape, South Africa. J Ethnopharmacol 1999;66:103-6. 14. Jia S, Lang M, Guo LH. Photoelectrochemical detection of oxidative DNA damage induced by Fenton reaction with low concentration and DNA associated Fe2+. J Phys Chem B 2008;112:4461-4. 15. Steenkamp V, Stewart MJ. Medicinal applications and toxicological activities of Aloe. Products. Pharm Biol 2007;45:411-20. 16. Van Wyk BE, van Oudtshoorn B, Gericke N. Medicinal Plants of South Africa. 2 nd ed. Pretoria: Briza Publications; 2002. p. 40-1. 17. Kambizi L, Sultana N, Afolayan AJ. Bioact iv e compounds isolated from Aloe ferox: A plant traditionally used for the treatment of sexually transmitted infections in the Eastern Cape, South Africa. Pharm Biol 2004;42:636-9. 18. Mwale M, Masika PJ. Medicinal plants used in ethno-veterinary control of gastrointestinal parasites in village chickens in the communal areas of the Eastern Cape. The Annual Indigenous Plant Use Forum Conference; Value Adding, Graaff Reinet, South Africa, 7-10 July, 2008:51. 19. Botes L, Van der Westhuizen FH, Loots DT. Phytochemical contents and antioxidant capacities of two Aloe greatheadii var. davyana extracts. Molecules 2008;13:2169-80. 20. Afolayan AJ, Grierson DS, Kambizi L, Madamombe I, Masika P. In vitro antifungal activity of some South African medicinal plants. S Afr J Bot 2002;68:72-6. 21. Yagi A, Kabash A, Mizuno K, Moustafa SM, Khalifa TI, Tsuji H. Radical scavenging glycoprotein inhibiting cyclooxygenase-2 and thrombox A2v synthase from Aloe vera gel. Planta Med 2003;69:269-71. 22. Wintola OA, Sunmonu TO, Afolayan AJ. The effect of Aloe ferox Mill in the treatment of loperamide-induced constipation in Wistar rats. BMC Gastroenterol 2010;10:95. 23. Wintola OA, Sunmonu TO, Afolayan AJ. Toxicological evaluation of aqueous extract of Aloe ferox Mill in Loperamide - induced constipated rats. Hum Exp Toxicol 2010;30:425-32. 24. Loots DT, Van Der Westhuizen FH, Botes L. Aloe ferox leaf gel phytochemical content, antioxidant capacity, and possible health benefits. J Agric Food Chem 2007;55:6891-6. 25. Wolfe K, Wu X, Liu RH. Antioxidant activity of apple peel. J Agric Food Chem 2003;51:609-14. 26. Ordon Ez AA, Gomez JD, Vattuone MA, Isla MI. Antioxidant activities of Sechium edule (Jacq). Food Chem 2006;97:452-8. 27. Kumaran A, Karunakaran RJ. In vitro antioxidant activities of methanol extracts of five Phyllanthus species from India. Food Sci Technol 2007;40:344-52. 28. AOAC. Official Methods of Analysis. 15 th ed. Association of Official Analytical Chemists. Arlington, V.A. ; 1990. 29. Harborne JB. Phytochemical methods. A guide to modern techniques of plant analysis. 3 rd ed. New Delhi: Springer Pvt. Ltd.; 2005. 30. Obadoni BO, Ochuko PO. Phytochemical studies and comparative efficacy of the extracts of some haemostatic plants in Edo and Delta States of Nigeria. Glob J Pure Appl Sci 2001;8:203-8. 31. Aiyegoro OA, Okoh AI. Preliminary phytochemical screening and in vitro antioxidant activities of the aqueous extract of Helichrysum longifolium. BMC Complement Altern Med 2010;10:21­8. 32. 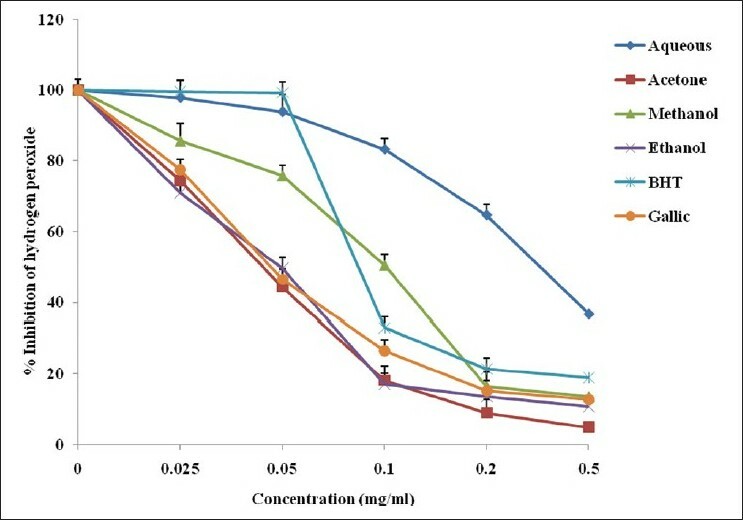 Liyana-Pathiana CM, Shahidi F. Antioxidant activity of commercial soft and hard wheat (Triticum aestivium L) as affected by gastric pH conditions. J Agric Food Chem 2005;53:2433- 40. 33. Dasgupta N, De B. Antioxidant activity of Piper betel L. leaf extract in vitro. Food Chem 2004;88:219­24. 34. Ozgen M, Schreerens JC, Reese RN, Miller RA. Total phenolic, anthocyanidin contents and antioxidant capacity of selected elderberry (Sambucus canadensis L.) accession. Pharmacog Mag 2010;6:198-203. 35. Hesham J, El-Seedi R, Vishiyama S. Chemistry of bioflavanoids. Indian J Pharm Educ 2002;36:191-4. 36. Pataki T, Bak I, Kovacs P, Bagchi D, Dipak DK, Tosaki A. Grape seed proanthocyanidins improved cardiac recovery during reperfusion after ischemia in isolated rat hearts. Am J Clin Nutr 2002;75:894-9. 37. Dash GK, Bal SK, Annapurna MM, Suresh P. Studies on the hypoglycemic activity of Hemidesmus indicus r. Br. roots. Pharmacog Mag 2008;4:221-5. 38. Okwu DE, Emenike IN. Evaluation of the phytonutrients and vitamin contents of Citrus fruits. Int J Mol Med Adv Sci 2006;2:1-6. 39. Ruch RJ, Cheng SJ, Klaunig JE. Prevention of cytotoxicity and inhibition of Intercellular communication by antioxidant catechins isolated from Chinese green tea. Carcinogenesis 1989;10:1003-8. 40. Liu J, Henkel T. Traditional Chineese medicine (TCM): Are polyphenols and saponins the key ingredients triggering biological activities? Curr Med Chem 2002;9:1483-5. 41. Mondal SK, Chakroborty G, Gupta M, Mazumder UK. Hepatoprotective activity of Diospyros malabarica bark in carbon tetrachloride intoxicated rats. Eur Bull Drug Res 2005;13:25-30. 42. Gordon MH. The mechanism of antioxidant action in vitro. In: Hudson BJ, editor. Food Antioxidants. London: Elsevier Applied Science; 1990. p. 1-18. 43. Oyaizu M. Studies on products of browning reactions: Antioxidant activities of product of browning reaction prepared from glucosamine. Jpn J Nutr 1986;44:307-15. 44. Ross R. The pathogenesis of atherosclerosis: A perspective for the 1990. Nature 1990;362:801-3. 45. Cotran RS, Kumar V, Colins T. In: Robbins Pathology Basis of Disease. 6 th ed. Noida, India: Thomson Press Ltd.; 1999. 46. Gulcin I, Oktay M, Kirecci E, Kufrevioglu OI. Screening of antioxidant and antimicrobial activities of anise (Pimpinella anisum L) seed extracts. Food Chem 2003;83:371-82. 47. Sakanaka S, Tachibana Y, Okada Y. Preparation and antioxidant properties of extracts of Japanese persimmon leaf tea (kakinoha-cha). Food Chem 2005;89:569-75. 48. Moskovitz J, Yim MB, Chock PB. Free radicals and disease. Arch Biochem Biophys 2002;397:354­9. 49. Gutteridge JM. Age pigment and free radicals. Fluorescent lipid complexes formed by Iron and copper containing proteins. Biochem Biophys Acta 1985;834:144-8. 3 Impact of Different Extraction Solvents on Bioactive Compounds and Antioxidant Capacity from the Root of Salacia chinensis L.
4 Effect of climate change on phytochemical diversity, total phenolic content and in vitro antioxidant activity of Aloe vera (L.) Burm.f. 8 Impact of spatial and climatic conditions on phytochemical diversity and in vitro antioxidant activity of Indian Aloe vera (L.) Burm.f. zengin, g. and sarikurkcu, c. and aktumsek, a. and ceylan, r. and ceylan, o.
Silva, M.A. and Trevisan, G. and Klafke, J.Z. and Rossato, M.F. and Walker, C.I.B. and Oliveira, S.M. and Silva, C.R. and Boligon, A.A. and Flores, F.C. and Silva, C.D.B. and Athayde, M.L. and Ferreira, J.
Sen, S. and De, B. and Devanna, N. and Chakraborty, R.
Mythri, R.B. and Harish, G. and Bharath, M.M.